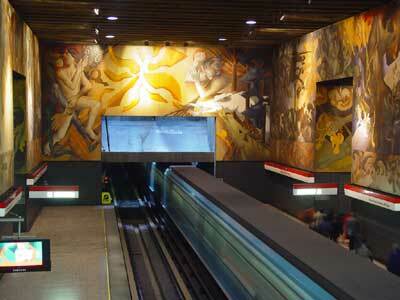 Santiago, Chile, has a very modern and efficient subway system known as the Metro. It is definitely easier to take the Metro than navigate the more complex bus system in the city. Many of the Metro stations boast beautiful architecture and design. Stations frequently house works of art including paintings and sculptures. The Metro stops are clean, spacious, and easy to navigate. The Metro system utilizes a varying fare rate based on the time of day you travel. Prices are higher during peak rush hours (7:00-9:00 and 18:00-20:00) and lower in the middle of the day, evenings, and weekends. Fares average around $680 pesos or about $1.00 USD. Discounts are given to students and senior citizens. For current rates, see their fare page (in Spanish). My experiences on the Metro were always very positive. The service is clean, safe, and very quick. You may have some trouble during peak travel times. These times bring large crowds and cramped station platforms that quickly fill the subway cars to capacity. However, during non-peak times, the Metro is a pleasure to ride. Here’s a Santiago Chile Metro Map to help you navigate through the city. Even with a metro map, you’ll still need to remember a few key points about riding the Metro. Try to avoid rush hour (called punta) as the subways are literally packed with people. Imagine a can of sardines being squished by another can of sardines and you’ll get the picture. Prices vary based on the hour of the day with a three-tier pricing structure. You’ll pay more during rush hours (morning and night) than during the off-peak hours. 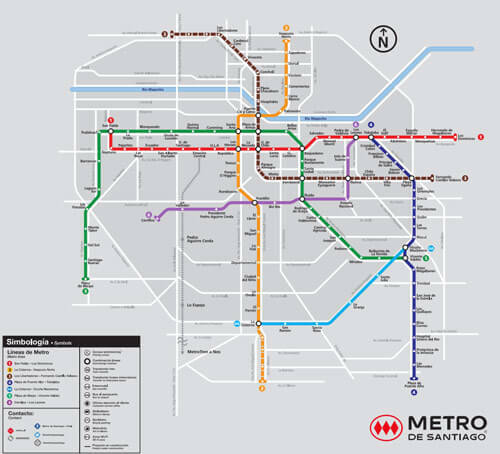 Use the Santiago Chile Metro map to help plan your trip before you get to the station. This will help you know which line to take and which station is your destination. Avoid touching or leaning on the subway car doors. You don’t want to explain why you caused the train to stop. Walk with the flow of the crowd, avoiding going upstairs or escalators against the flow of passengers. There will be very heavy crowds, don’t be the person that awkwardly goes the wrong way. Give up your seat to the elderly, disabled, or pregnant women. 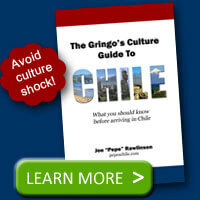 Yes, what your mother taught you applies in Chile, too. Don’t block the doors from closing on the train. Most people on the train want to get somewhere in a hurry. Don’t cause them to miss their appointment. Hold on to the rails or sit down on the train to avoid falling. 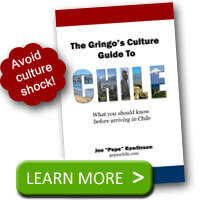 Like many other trains or subway systems, the Santiago Metro can jolt suddenly and cause you to fall. With these tips in hand and a review of the Santiago Chile Metro Map above, you’ll be all set for a great trip on this mass transit system. I suggest you add an explanation to this writeup that, on some lines, the trains do not stop at every station. I know how to read the map to indicate such but not how to tell which trains stop at red stations and which stop at green stations. @Andrew – good point. The Santiago metro website gives a good explanation of the Express service. Here’s a English translated version of the page. Say what?? There’s a flow? This is not the Washington Metro Transit where there is an obsessive degree of order of traffic with walkers moving in order, riders on escalators to the right, people running up or down the escalator to the left… and those who fail to be thrown over the edge by the locals annoyed that you failed to comply with said order. I have not once noticed anything more than the merging mob moving in what ever direction it so desires. And given that the older stations still are not compliant for accessibility for people with disabilities or old age and bum knees, there is no recourse but to bully your way into whatever side or middle that has a railing free so you don’t fall down on your kester due to collapsed knees while trying to weave your way up or down. @Donna – you’re right, it definitely isn’t the Washington Metro. Thanks for detailing more of the reality of riding the Metro in Santiago. It is survival of the fittest. Beware of the Pickpockets on the Metro. They work in teams and are reputedly the best in the world. Both my wife and I have been victims. @David – thanks for bringing that up. Pickpockets are always a concern on the Metro.